This contemporary, two-toned plastic frame magnetic 3-in-1 dry erase calendar combo board is a perfect and functional solution for the frequent usage areas of your home, office, school classroom, any commercial space. 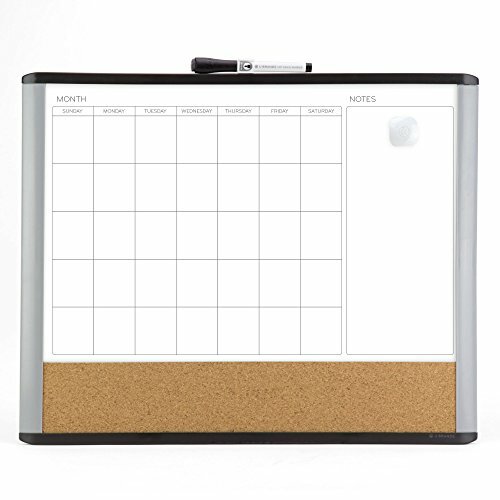 This magnetic calendar whiteboard is a perfect solution to keep your life organized well beyond the board's dry erase function. Easily plan at least 30 days in advance with a monthly view whiteboard surface. The whiteboard's magnetic writing surface requires minimal ongoing cleaning care to ensure the best performance and resist ink staining and ghosting. Simply use any dry erase board spray or wet dry erase board wipes after continuous use to clean the writing surface. Although all dry erase markers work well with this board, the U Brands dry erase markers provide the ultimate writing and eras ability experience. A medium point black dry erase marker is included with the board; the marker cap features a built-in eraser for easy and convenient eras ability. The board's magnetic writing surface functions as a bulletin board as well; simply use any board magnets to pin all of your notes, messages, pictures, memos, calendars, menus, reminders and more. A Pin-It cork magnet is included with the whiteboard, which enables you to pin your messages using push pins directly onto the board and move the pin surface to the most convenient location within the board. You may also customize your board with U Brands Groove snap-in frame accessories (sold separately). All U Brands Groove accessories and marker clip can be snapped into any side of the frame to customize the board. The modern black and gray two-toned plastic frame provides a firm and rigid board construction. This contemporary dry erase board features U-Mount hassle free mounting system, which makes hanging this board a simple breeze.